Browse photos below featuring a few of our local events. Also check out our reviews. Please stop by and see what all the fuss is about and leave your own review on Yelp. Thank you! Many thanks to Steve Dolinsky, Chicagos “Hungry Hound” for his wonderful piece on Harbor Country in which we’re featured! Oysters are incredible, so fresh. Porchetta is fantastic…. Amazing flavors and perfectly prepared, the au jus to accompany is well balanced — a wonderful dish. Tallegio was perfectly ripe and my favorite. so glad to find here! One of the best sandwiches I have ever had. Super fresh, awesome salads, cheeses and meats. The oyster bread pudding was to die for. Can’t wait to try more. Rachel is our new go to. Fresh, friendly, clean and wonderful staff makes this little gem a must visit place for Harbor Country visitors! Even contemplating the 1.5 hour drive just for the scallops! We’ve never had scallops as amazing, melt in your mouth and dense like the ones Rachel gets in. Everything is delicious and love the small business “take care of you” feel. Best wishes for many more years of success. Amazing variety of foods. We stopped by just to check it out but ended up having lunch! An amazing lunch. Had the salmon bacon lettuce tomato sandwich. They had super chairs and tables outside the shop where we had our lunch. Bit of Provence. Catering menu top notch and the other foods they had on their deli cases really tempting. Will be back!!! Probably the finest quality food here in Harbor Country! Always fresh, always polite and fast so you can easily pop in to pick up lunch. The Salmon BLT is a great lunch option but you really can’t go wrong with anything on the menu. Fish and chips are great and even the non-seafood items are terrific. The hot smoked salmon is as good as I have tried anywhere! The smoked salmon dip is to die for. I love swinging by as a quick to go meal and getting the fish and chips or a side. In addition to the freshest fish in the midwest, they have great cheeses. In addition to the glorious seafood they can give you great advice on how to cook things and recipes! They do wonderful catering for holidays if you just want to pick something up instead of slaving away for a large party. 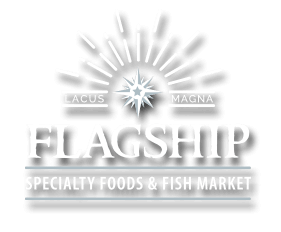 Great specialty seafood shop, nothing else like it in the area. The fresh seafood is amazing, as well as the special sides and dips. They also have some of the best fish and chips around! Always consistent, definitely a new favorite! All the food items were better than we’ve ever had in this area. Rachel was very welcoming, understands the products and knows customer service! Our son has raved about your food, and brought us a bunch of cod that we loved. Entire family thoroughly enjoyed our dinners. Tremendously helpful and knowledgeable staff. The team is knowledgeable and has A++ products! Will be back to try more! The porchetta is outstanding, the fish and chips dish is also a winner. The crust is light, crisp and the fish incredibly moist. 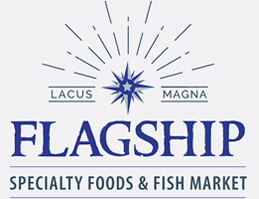 So glad flagship has come to town, and can’t wait to see what Rachel comes up with next as she adds new items daily. Delighted to discover this great place. The clam chowder is one of a kind. Try the hot smoked salmon! Looking for an amazing French baguette that you can’t find anywhere in the area? They have them here!!! And the fish and chips… oh boy. We ordered lobster tails, shrimp, clams and mussels for our paella and the seafood was superb as was the service. The selection is eclectic and focused on the seafood. The deli case has some lovingly prepared foods to go. 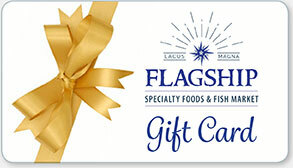 Fully redeemable at Flagship Specialty Foods. Find out more. ©2016 Flagship Foods. All Rights Reserved.